Are you thinking of buying a used car? Do you own one and want to get it inspected to ensure its safety? Maybe you are heading out for a long road trip and want to make sure there are no hiccups on the road. All these are good enough reasons to have your vehicle inspected by one of our technicians. We get constant queries from both buyers and sellers of used cars asking for inspection services. Though for different reasons, auto inspection service is important for both of them and our ASE certified technicians specialize in providing quality service. For used car sellers, our technicians help a car stand out from the rest. After thorough inspection, they prepare a report which sellers can use to demand a better price. Knowing the accurate value of the car is beneficial for sellers and buyers alike. Our technicians check a used car in detail and let customers know if there are any issues that need to be taken care of. Consumers depend on us for making a buying decision. We ensure that they avoid buying a used car with serious damages that are fixed at a high repair cost. Concourse Auto Service is fully certified for vehicle emissions inspection. If you are looking to buy a used car, but concerned about its emissions standard, call us now. We will make sure your car is not polluting and meets the Texas air quality standards. We are accredited with AirCheck Texas certification and this makes us qualified to inspect vehicles in the state for emission standards. We can ensure that your vehicle meets emission standards, and will also work with you to get state assistance if your vehicle fails this test. The state will provide assistance for repairs to the emissions system. We have helped hundreds of buyers and sellers make informed decisions on buying used cars. Our emission inspection services make it easy for both these groups of customers get fully compliant cars with complete clarity on cost. Our emissions certification and car inspection report is all they need to buy or sell the car with complete peace of mind. Call us today for comprehensive vehicle inspection services. Belts and hoses wear out faster than any other parts in your car. It is important to get the belts and hoses of your car inspected at regular intervals. We at Concourse Auto Service inspect all belts and hoses to optimize your driving experience. Concourse Auto Service is your one-stop-destination for troubleshooting any problems that you may face with your car including leakages. Whether it is oil or water leaks, our professionals will identify the problem and get it fixed instantly during our comprehensive inspection services. People often neglect undercarriage inspection and consider it inconsequential. Undercarriage inspection is an essential part of our inspection services to ensure that your car functions smoothly. We use state-of-the-art equipment to inspect undercarriage of your vehicle. There are several essential fluids, such as coolant, transmission fluid, engine oil, brake fluid, and power steering fluid among others that need regular check to ensure the smooth operation of your vehicle. During our car inspection service, we inspect fluid levels to ensure that each essential fluid is maintained at its optimal level and reduce repair costs. The typical fuel system of a car includes fuel injectors, pump, tank, lines and injection pump assembly. Maintenance of fuel system is something that is pivotal to keep your car running smoothly on the road. Our car inspection services also include fuel system inspection in addition to the other services that we offer. When it comes to safety, brakes are the most essential feature of your car. An unprecedented brake failure due to lack of maintenance may lead to serious accident. It is important to opt for routine maintenance to keep the brakes & rotors of the vehicle in good and working condition. We have expertise in providing brakes & rotors inspection to check their workability. Routine inspection of your vehicle is an effective way to reduce unforeseen breakdowns and expensive repairs. We check the tires of your vehicles for damages such as tread wear, cuts, foreign objects while inspecting your vehicle. Our holistic car inspection services include checking even the minor damages to maximize the life of your vehicle’s tires. Routine inspections of air conditioner is important for early detection of leakages and damages in the air conditioning system of your car, which not only saves you time but also money. Our inspection services includes checking the air conditioning system of your vehicle to ensure that there is no refrigerant leaks. A cooling system, as the name suggests, prevents the internal combustion engine of your vehicle from overheating. It is suggested to get your vehicle’s cooling system inspected regularly to maintain its performance. Our technicians are well trained to inspect the cooling system, identify problem and offer solution right on the spot to avoid problems in the future. An electrical system is a closed circuit, instrumental to provide power to your car. It comprises of battery, starter, and alternator and if any of these components stop working, it affects the functioning of your car. When you hire our inspection service, we ensure that electrical system is in place i.e. all its components are working properly. 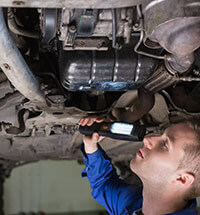 Exhaust inspection, although looks simple, is a complex service. It includes visual inspection of the exhaust to the tail pipe. During the process of exhaust inspection service, our professionals ensure that you vehicle pass an emission test before handing it over to you. Car suspension is one of the basic but essential components of your vehicle, and is instrumental to keep your car running smoothly. A car suspension endures daily wear and tear of rough roads and overtime may have an impact on the steering mechanism of your car. We also provide comprehensive suspension inspection services for your vehicle. Contact us today.